Welcome to my first decent baking experiment on PhooDJournal. The reason I don’t bake often is because I’m not very good at 1) following instructions and 2) measuring things precisely, both of which are crucial when it comes to baking. My brother is probably a better cheesecake baker than me – for a period of about a month, he made a large cheesecake once every couple of days. I guess he was practicing (for what, I don’t know), but I was the lucky beneficiary, and could always count on a slice of cheesecake whenever I had a craving. 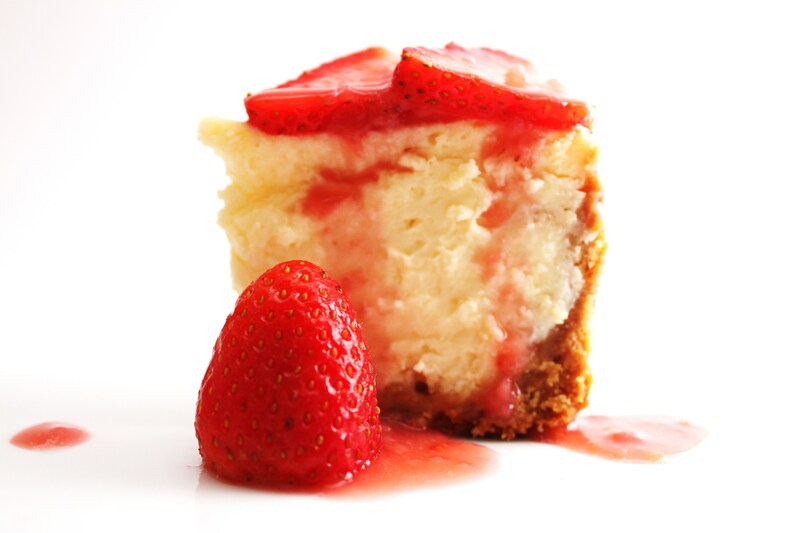 Cheesecake isn’t really a cake; it’s more like a custard. It’s simpler to make than most people think, tastes delicious, and not so easy to mess up. In other words, it’s my kind of baking recipe. 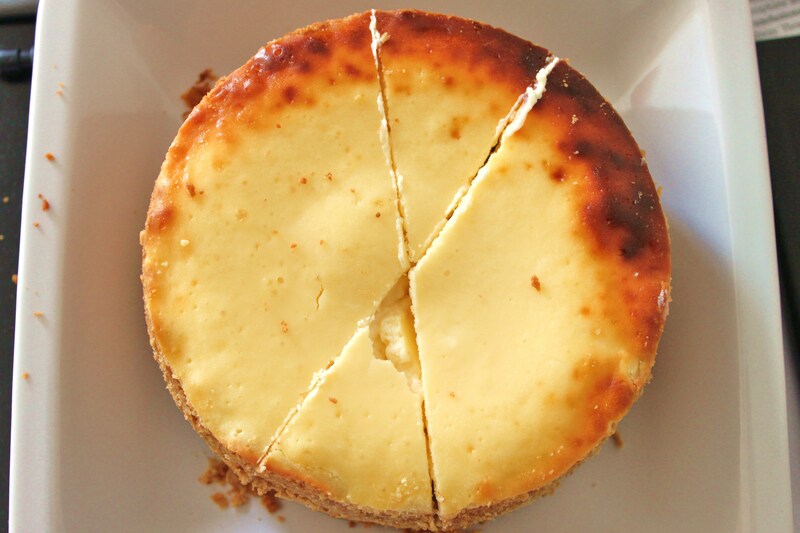 My favourite type of cheesecake is New York-style, since the crust is one of my favourite parts. I haven’t seen graham crackers in Germany, so I substituted with Butterkeks, which don’t have the same crunchiness or honey flavour, but they do the basic job just fine. And, of course, since I made this recipe up myself, the exact measurements probably aren’t too important – if the batter is easily pourable and tastes yummy before you put it in the oven, it’ll be fine when you take it back out! Put crackers into a resealable bag and smash (with fist, cup, rolling pin, whatever) until fine. 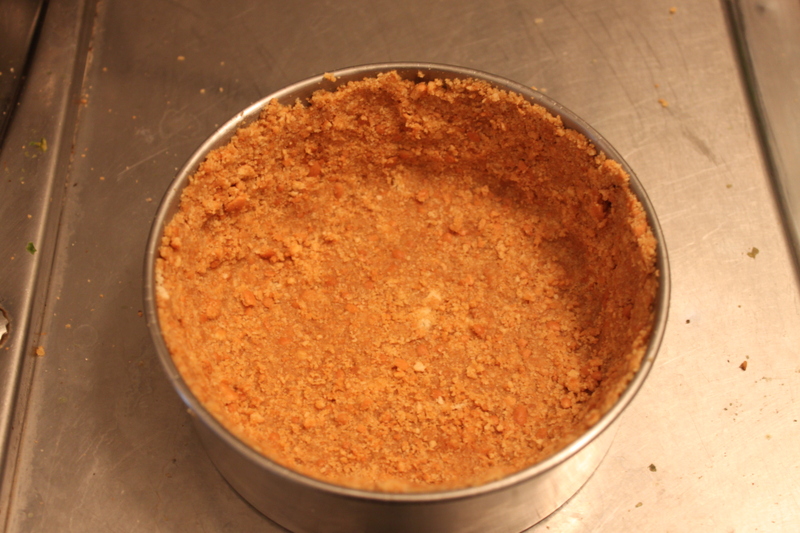 Pour in butter and squeeze butter and crumb together. If the crumbs don’t hold together, add more butter. If the mixture looks too oily (if there are oil trails on the inside of the bag), add more crackers. Dump contents of bag into a cake form and press the crumb mixture into the bottom and sides of the pan, making sure the mixture is well-packed. In a bowl, add the cheese, eggs, sugar, and vanilla. 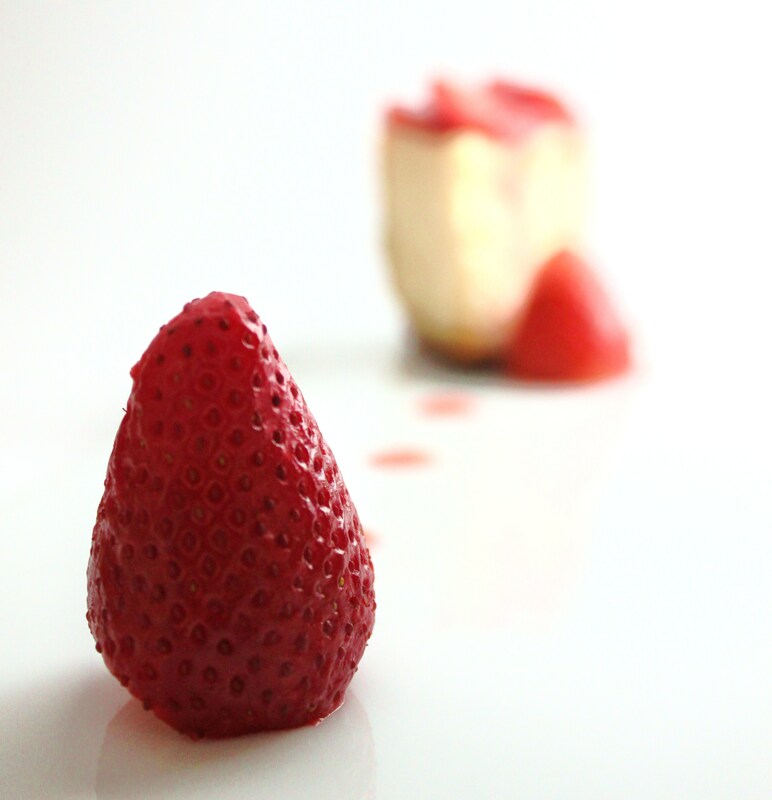 Blend using a stabmixer (engl: immersion blender) or a hand mixer until smooth. Bake at 220C (using the bottom element only) until the edges appear somewhat firm, but the middle is still a bit jiggly (about 20 min). Remove from oven and cool at room temperature for 2 hours. Set in fridge overnight at 4C. Cut using a warm knife, being careful while cutting through the centre (since it’s the most fragile part). I make a bit of a strawberry sauce from cut up strawberries boiled in sugar and water…it’s not as bright red as the sauce in restaurants, but I think they add food colouring. Blueberries, raspberries, or any other type of berry would go just as well. 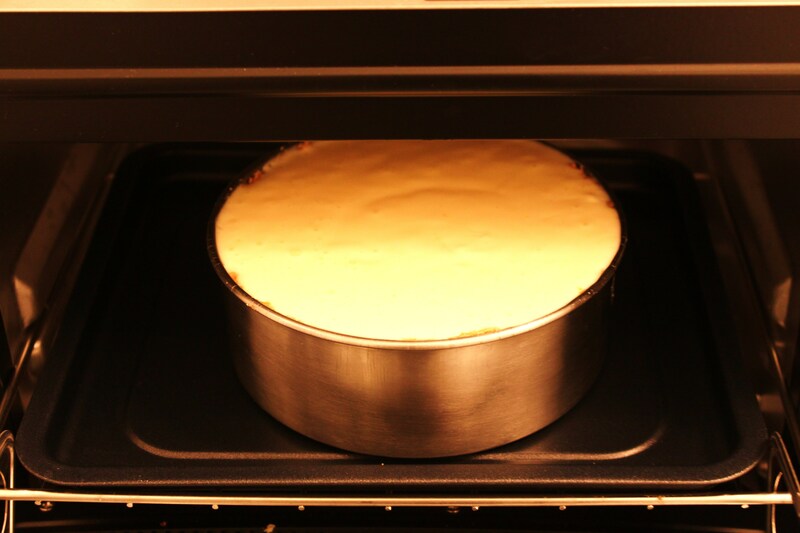 You can’t really overbake a cheesecake the same way you overbake a normal cake, but if you turn on the top element, the top of the cheesecake burns rather quickly or it can crack, so it’s best to turn only the bottom on and let the heat circulate through the oven. Right, I thought this was going to be a quick write-up, but evidently not. Need to sleep NOW – Paris tomorrow. < Previous Egg-citing? Egg-xotic? Tamagoyaki!